Mr. Trump’s proposed solution is protectionism by raising tariffs as much as 45%. This recalls the Smoot-Hawley Tariff, which triggered a vicious trade war while Congress debated the legislation in 1929 and after President Hoover signed it in June 1930, just as the chaotic interwar monetary system was collapsing. Despite the Texas senator’s economic sophistication, it is logically and economically implausible to solve a monetary problem, created by predatory currency depreciation, with a tax plan. A tax problem must be resolved by a tax solution. But a tax reform is neither necessary nor sufficient to rule out currency wars. Floating currencies can be depreciated faster and further than import taxes can be adjusted. Rising import taxes (i.e., tariffs) intensify the very problem of protectionism they pretend to solve. A currency issue, or a monetary problem, must be resolved by a currency and monetary solution. Today’s monetary problem is the floating exchange-rate system, combined with the dollar’s peculiar global role as the world’s chief official reserve currency. Foreign countries use expansive monetary policy to depreciate their currencies relative to the U.S. dollar, hoping to gain a trade advantage by exporting unemployment. Thus the true solution can only be a currency or monetary arrangement that does not encourage predatory currency depreciation. The necessary solution must exclude floating exchange rates, and substitute a system of stable exchange rates without official reserve currencies. But how? Pursuant to the U.S. Constitution (Article I, Sections 8 and 10), the dollar was defined by Congress in law as a weight of precious metals (gold and silver) for most of American history, from the Coinage Act of 1792 until 1971. Dollar-denominated securities have been used as official reserves by many countries at least since the Genoa Agreement of 1922, and by most countries since the Bretton Woods monetary agreement of 1944. Under both agreements, dollar securities were redeemable in gold. But the experience of both the failed interwar and Bretton Woods systems showed that competitive devaluations are only part of the problem. By “duplicating” credit, as the French economist and central banker Jacques Rueff (1896-1978) described it, the official reserve-currency system causes the domestic price level to rise in the reserve-currency country, relative to other countries, even while exchange rates remain (temporarily) fixed. For example, since 1955, producer prices for manufactured goods have roughly tripled in Germany, but more than sextupled in the U.S.—creating never-ending pressure from American industry to devalue the dollar, while causing unpredictable swings in the prices of both countries’ goods expressed in the same currency. 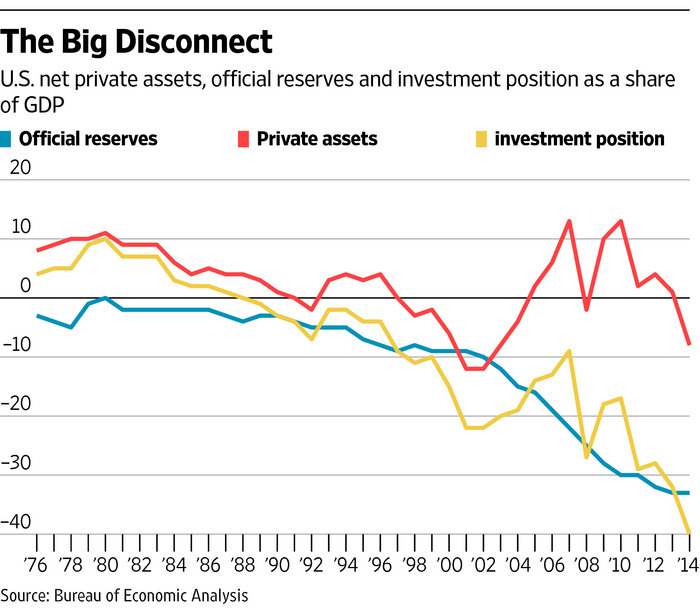 As the nearby chart shows, U.S. net official reserves were already substantially negative by the 1970s. Moreover, the increase in foreign official dollar reserves is matched by an equal deficit in the U.S. private trade and capital accounts combined—even when private U.S. residents’ books remain near balance with the rest of the world. Since President Nixon ended dollar convertibility to gold in August 1971, the international monetary system has been based on the world paper-dollar standard. The international monetary system has become, as in the depressed 1930s, a disordered arrangement of floating currencies, whereby any country can depreciate its currency against the dollar. Some countries even fix their exchange rates to the dollar at an undervalued level for long periods, as China did in the early 1990s. This is when China’s industrialization gained momentum as it became the workshop of the world. The pattern today is for countries, even the European Union, simply to lower the effective real level of wages by depreciating their currencies against the dollar to gain comparative advantages in international trade and by import substitution. In these countries (such as Brazil), local wages are paid in depreciating local currencies, thereby lowering the relative cost of labor. Labor compensation today accounts for one-half to two-thirds of the total cost of production in every economy. Thus American workers have been put at a competitive disadvantage with countries that are depreciating their currencies. This floating exchange-rate system, combined with the official reserve-currency role of the world dollar standard, explains why free trade has been getting a bad name among Democrats, Republicans and independents. Under the floating exchange-rate reserve-currency system, free trade has become no more than a romantic fantasy. The solution is to establish a level trade playing field with a system of stable exchange rates among the nations of the G-20, or at least the G-7, to which emerging countries will conform. Such a solution would require the next president to bring together the major world leaders to establish stable exchange rates to avoid trade and currency wars that inevitably lead to protectionism and sometimes to real wars. This international monetary solution of stable exchange rates would eliminate the burden and privilege of the dollar’s reserve-currency role. Neither tax, nor regulatory, nor budget reforms, however desirable, will eliminate currency wars. To restore America’s competitive position in production, manufacturing and world trade, stable exchange rates are the only solution tested in the laboratory of U.S. history—from President Washington in 1789 until 1971. Stable exchange rates have proven throughout history to establish the most reliable level playing field for free and fair world trade. There are no perfect solutions in human affairs. But the history of the past three centuries suggests that stable exchange rates, resulting from adoption of currencies mutually convertible to gold at statutory fixed parities, are the least imperfect solution to avoid currency and trade wars. Mr. Lehrman is the author of “Money, Gold & History” (TLI Books, 2013) and Mr. Mueller is the author of “Redeeming Economics: Rediscovering the Missing Element” (ISI Books, 2014).